Southern has been awarded a $10,000 Seeds of Hope grant – an allocation that will enable the university to develop a support program for students already in recovery from substance abuse disorders. The grant emanates from the non-profit organization “Transforming Youth in Recovery,” which focuses on the creation of campus collegiate recovery programs across the nation. It has been awarded at a time of a growing opioid abuse problem throughout the country. Sarah Keiser, SCSU’s coordinator of alcohol and other drug services, said the three-year grant will enable Southern to provide the social, academic and in some cases, residential support systems for these students. She said that in the second year, the university will seek to establish programs and means of support. Keiser said among the possibilities are the creation of a lounge area for the students; connecting them with the Academic Success Center and peer-mentoring programs; and the development of a living, learning community and roommate pairing. Keiser said that in addition to the primary objective of helping students maintain a clean living style in recovery, the programs that will be funded through the grant also can have a positive effect on student retention and graduation rates. She applied for the grant in April, and received word that Southern would be a recipient at around the time fall classes began a few weeks ago. 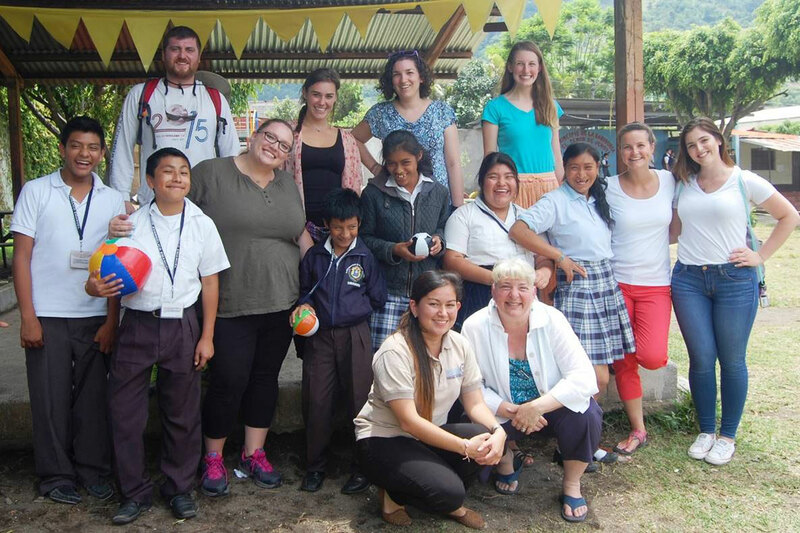 This summer, two groups of Southern students — one studying special education, and the other, public health — traveled extensively in rural Guatemala during a two-week short-course abroad. 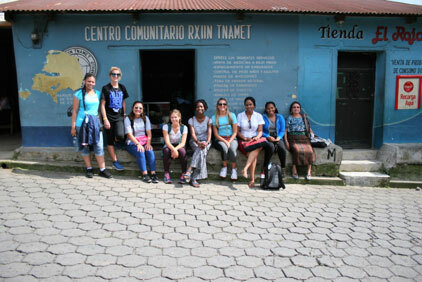 Journeying together, while learning in two separate courses, participants from both groups explored the colonial town of Antigua, Guatemala, and its surrounding pueblos; Mayan villages in the country’s central highlands, including breathtaking Lake Atitlán, the caldera of an ancient volcano; and the lush jungle rainforest at Tikal National Park, site of vast archaeological ruins. Students enrolled in the special education course, led by Dr. Kara Faraclas of the Department of Special Education and Reading, visited a variety of schools and programs for persons with disabilities, and met their inspiring founders and directors. 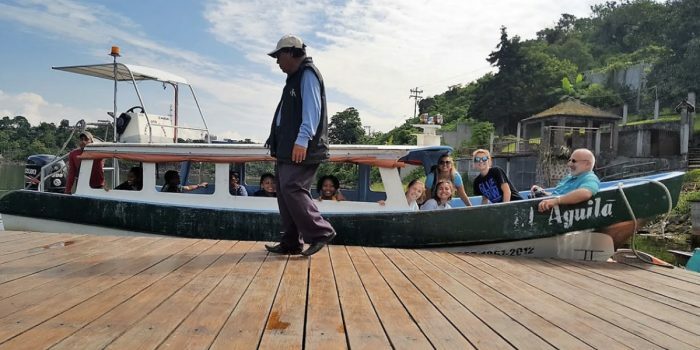 Public health students, led by Dr. William Faraclas of the Department of Public Health, explored health program and facilities and engaged other providers of health services in Guatemala, including shamans and traditional birth attendants. The use of field guides developed especially for the two programs — the Quest for Understanding for public health students, and the Field Guide for the Journey for the special education group — fostered the interaction of students with people in the communities they visited, as students sought and analyzed information provided by cultural informants, used to compose essays for their field guides and perform community assessments. During their time abroad, participants in both courses distributed greatly needed supplies they had carried from the United States. Students in the special education course provided materials to support the work of teachers of students with disabilities, and those in the public health course presented greatly needed medical supplies to health clinics. 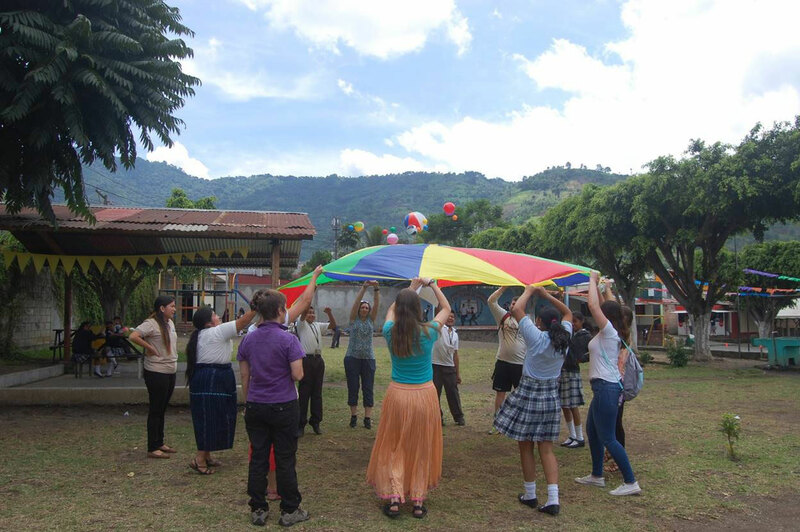 Accentuating and complementing the academic experience, students in both courses spent a day with an indigenous Mayan family, hiked to outlying villages, climbed ancient pyramids, sighted monkeys and toucans in the wild, and observed smoke and fire from an active volcano. Both courses focused on an underlying theme of culture as a way to prepare teachers, health practitioners and participating students from other disciplines to work effectively with an increasingly diverse population in the United States and for opportunities in other countries. 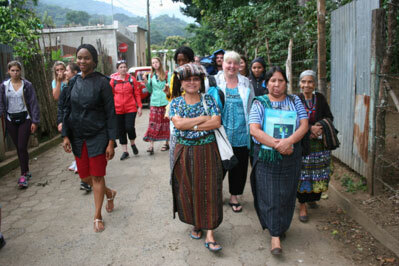 Several past enrollees were accepted into the Peace Corps and AmeriCorps, and this year’s students in both courses reported gaining from their experiences in Guatemala a new understanding of how their studies at Southern would enable them to work globally or at home to help alleviate suffering and promote social justice. 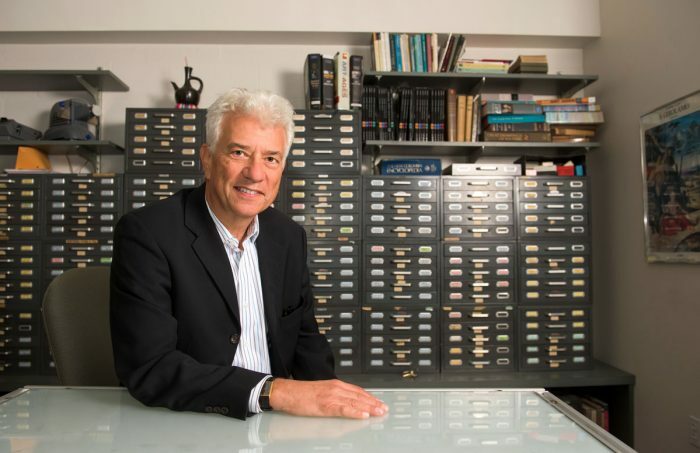 David Levine, chairman of Southern’s Art Department and an expert on art history, has been selected for one of the most prestigious faculty awards within the Connecticut State Colleges and Universities system. The state Board of Regents for Higher Education on Tuesday bestowed Levine with the title of Connecticut State University Professor. Southern, Central, Western and Eastern Connecticut State universities each can have up to three such professors. It is awarded in recognition of excellence in the areas of creative activity (research), teaching and service, and includes a peer review process. Levine fills an SCSU vacancy left by the recent retirement of Joseph Solodow, professor of world languages and literatures. He joins Vivian Shipley, professor of English, and Terrell Ward Bynum, professor of philosophy, as SCSU’s contingent of CSU Professors. Troy Paddock, chairman of the CSU Professor Advisory Committee, said the committee concluded that Levine met or exceeded the standard of excellence required for consideration in each of the three criteria. “Dr. Levine’s most significant research has been a new interpretation of the bambocciata, an anti-heroic genre painting style invented by Dutch artists in Rome,” Paddock wrote. “His work has been singularly responsible for a reassessment of the work of these figures. 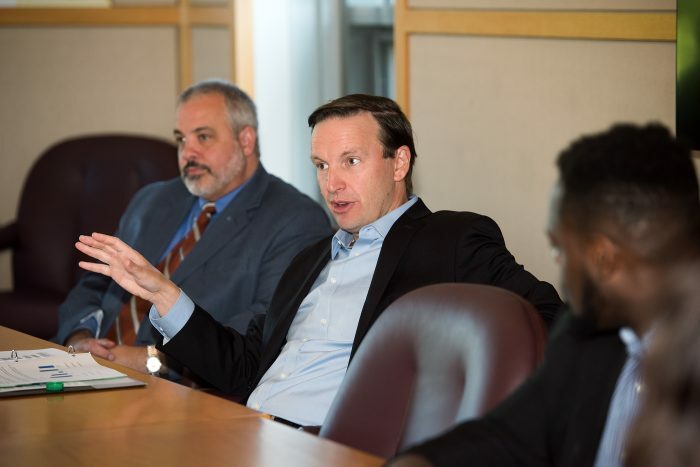 U.S. Sen. Christopher Murphy (D-CT) met with nearly two dozen Southern students on Sept. 1 to discuss issues related to college affordability and other logistical hurdles toward getting a degree. Murphy outlined his thoughts, as well as listened to the questions and concerns from the students and SCSU President Joe Bertolino. The hour-long roundtable discussion also attracted several staff members who work with students on a regular basis. Murphy said the percentage of students nationwide who graduate from college in four years has declined in recent years. “Today, the traditional student is someone who is going to class for five to seven years, either full time or part time,” Murphy said. He also noted that the average age of a college graduate is moving closer to 30 years of age. At the same time, “it is three times as expensive to get a bachelor’s degree today than it was in 1980, and that’s adjusted for inflation,” Murphy said. Murphy expressed his support for the federal government to provide a free college education, at least for low- and middle-income families. But he also suggested that it might be time to revamp how degrees are awarded – away from requiring a specific number of credits and toward a system that is based on competencies. In other words, if a student reaches a level of proficiency in a designated set of disciplines, they should be awarded a college diploma, whether it’s through a class or exam. He said that could reduce the time needed to spend in college. “The traditional four-year model is arbitrary based on what people had said it should be many years ago,” he said. Students raised several issues during the meeting, ranging from frustration with the onerous financial aid forms to mounting costs to the challenges of working and going to school. President Bertolino noted that the overwhelming majority of students work full time or part time. “(In many respects), we’re a working-class university,” he said. One student praised the creation of the position of coordinator of student financial literacy and advising to help students navigate the financial challenges of college life. Lew DeLuca serves in that role. Murphy praised Southern for being ahead of the curve in many respects.